Diigo provides a 2 step method to help you make the best use of your kindle highlights. Step 1: Import your kindle highlights to your Diigo library. Step 2: Organize highlights from a book in your own knowledge structure. Another interesting way to potentially cut out data from Amazon Kindle e-books in terms of annotations, marginalia, and notes. All props to the graduate student in Sociology who alerted me to this wonderful time saver. I knew that researchers could set up RSS feeds and e-mail alerts for tables of contents, but I wasn’t practicing what I preached. I’ve got my e-mail alerts set up for tables of contents of favorite library science journals (an oxymoron, I know), but truth be told, those were starting to feel a little old school. I’ve got RSS feeds set up in Google Reader for all my favorite library blogs (NOT an oxymoron). 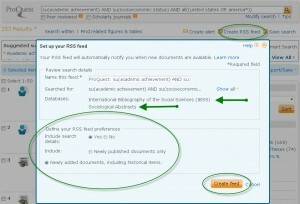 But, although we promote this, I hadn’t set up any RSS feeds from our databases. When a student in the Soc department asked me a question about his RSS feed, I finally set one up myself to see what he was seeing. You can do this in almost any database but my example above is from two databases we get via ProQuest: Sociological Abstracts and International Bibliography of the Social Sciences. These databases can be searched simultaneously and an RSS feed set up for their combined results. New citations that match my search show up in my feed reader, and as a bonus, the feed results import Find It links so if the articles are in full-text, I’ve got immediate access to them. Best of all, my time is saved by setting up this feed. I’m not constantly checking these databases for new articles on my topic. Instead, they’re delivered to me! To take it a step further is there an easy way to integrate it into other social tools like Instapaper, ReadItLater, et al or to have the full journal article results emailed to my Kindle’s address so that the papers all show up for instant reading on my Kindle, tablet, e-reader?! Thanks for the tip Ellen!